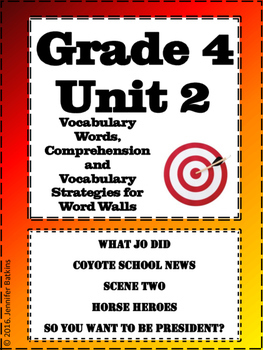 Word wall vocabulary words for Grade 4 Reading Unit 2 stories. 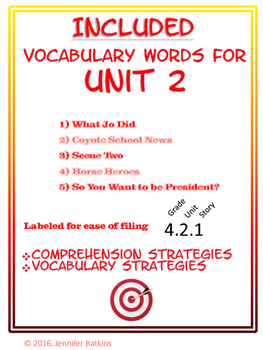 Stories included are "What Jo did", "Coyote School News", "Scene Two", "Horse Heroes", "So You Want to be President?". 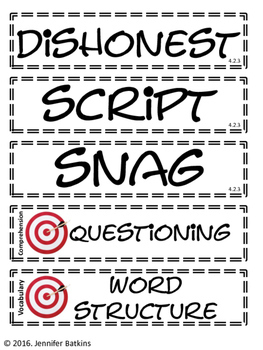 Also included are the vocabulary and comprehension target strategies for each story and a blank page for whatever you might want to add. Sized to fit nicely in a pocket chart. Or save money and buy the bundle!